The brochure features a fold-out chart that has developmental milestones for talking, hearing, and understanding from birth through age 5. 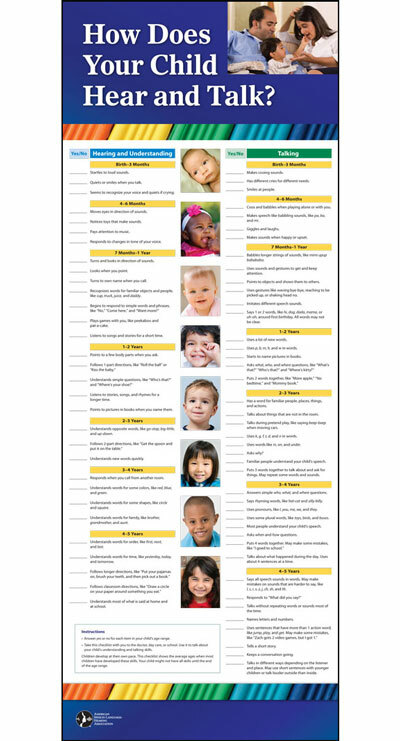 This chart can help parents and caregivers evaluate children’s speech, language, and hearing skills and determine if professional assistance from an SLP or audiologist is needed. The brochure also provides tips for families on helping children develop understanding and talking skills. Written in easy-to-understand language and illustrated with photographs. View all the How Does Your Child Hear and Talk? products.